I was travelling to Adelaide on the train this morning. 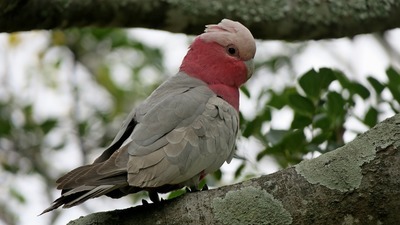 I had been making some notes on my mobile and then I looked up and saw this galah. I can hear some of you saying, well it's not unusual to see someone acting the fool on public transport. No, that's not what I mean. I mean, I saw a bird, a galah in a cage. A chap was holding the cage, getting ready to alight at the next stop. The galah was quiet in his cage and I would have missed seeing it if I hadn't looked up when I did. I know I often miss seeing things of interest because I am not taking note of what is around me. Perhaps I am gazing out the window, not really looking, lost in thought. Other times I am making notes on my mobile, which I don't consider to be a waste of time. There are times I am worrying or upset about something and so miss the good or interesting things around me. But there are plenty of times when I am alert to my surroundings. Sometimes it isn't something amazing that catches my attention but it is something that makes me think, 'You don't see that every day.' One day I saw a green plastic ball floating in the creek. I saw it again the next day a little further downstream snagged on a branch. Later in the week we had heavy rain and the ball was gone. I wonder if it made it all the way to the sea or got caught up again at some point downstream. Today I was in Rundle Mall Adelaide and it was FruChocs Appreciation Day. I took a couple of photos of the FruChocs Mascot because you don't see that every day. Some people would think, 'Who cares? There's nothing special about that.' However, I find little things can amuse me, provide a topic of conversation or even inspire me to write something. Whether I am walking, waiting for public transport or travelling on a train there are often things of interest to observe. Sometimes I just have to look a bit harder and take notice of what is happening around me.